Bluetooth (BLE) Asset Tracking solution extends tracking well beyond the capabilities of RFID or GPS. Our software and devices work seamlessly to track, manage and maximise the utilisation of high value assets. Regardless of what you would like to track, our Real Time Locating System (RTLS) will provide your business with the insights you require. Our UX team takes great care in designing all our solutions to fit the client’s specific needs, whether it’s mobile medical devices in hospitals, shipping containers in ports or car fleets. Our solution utilises Wi-Fi to BLE wireless gateways, BLE and local, private or cloud based servers. Each BLE Tag contains a unique ID that users can identify to a specific asset. Communication between the Tag and gateways is customisable and can be set to 1 second, 5 seconds and even daily calls with accuracy being as close as half a metre. Use our cutting-edge encrypted Bluetooth Leash's to build up a reliable and low-maintenance sensor-based infrastructure. Take sensors to their full potential with our easy to integrate online services such as asset tracking and warning notifications. We give you insights on running & idle times of technical equipment, utilisation and improving productivity with the LeashView Analytics and big data. LeashViews gives you all the data and the tools to optimize the efficiency of work processes and to take the best business decisions. Do you know how many assets your company has? What condition they’re in or where they’re located? Who or what department is using them? Mobile asset tracking is a critical component of effective resource allocation. LeashView asset tracking software makes monitoring and reporting easier for you and your organisation. Every LeashView beacon is equipped with an powerful and highly-sensitive bluetooth transmitter for the best tracking and positioning results. Track mobile assets in real-time and get accurate timestamps. 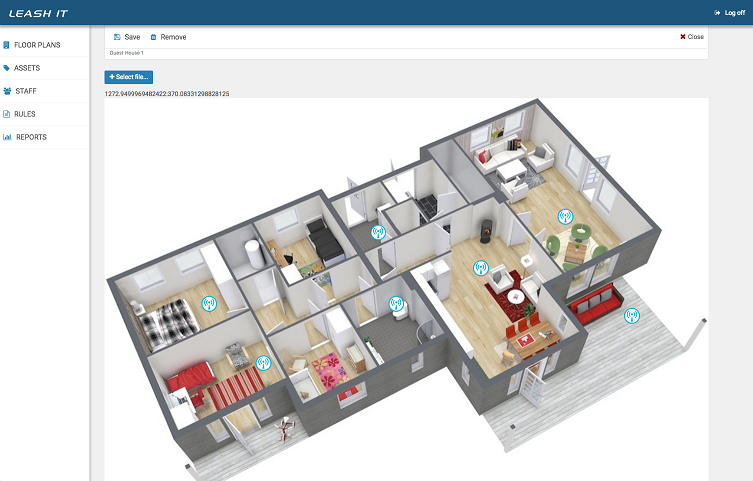 LeashView enables you to track and locate any beacon-equipped subject of interest on a floor plan. 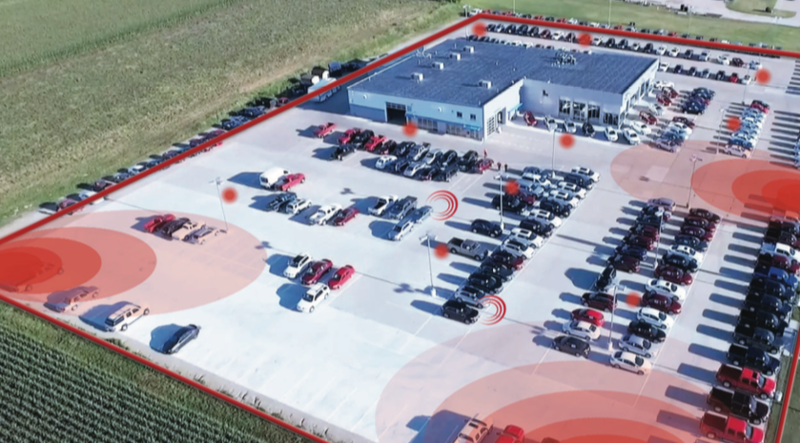 Innovative bluetooth technology in combination with our powerful software architecture gives you essential insights into asset location and customer behaviour. Every LeashView beacon comes with a powerful lithium battery that lasts up to two years with minimal maintenance. We are constantly working to improve our advanced LeashView firmware. With regular updates you will always be up to date without even touching the hardware. Whether it’s retail, transportation or facilities tracking. LeashView helps you to find and implement the best strategies to increase efficiency and raise overall profit. Once processed through our servers, Tag locations can be viewed on our secure web portal. In this example we show the cost of tracking 300 assets over a site with 50 locations. As shown in this example, the savings are massive compared to traditional Cellular tracking systems or Active RFID system. Not only are the savings on hardware considerable, the operating costs too are much lower. 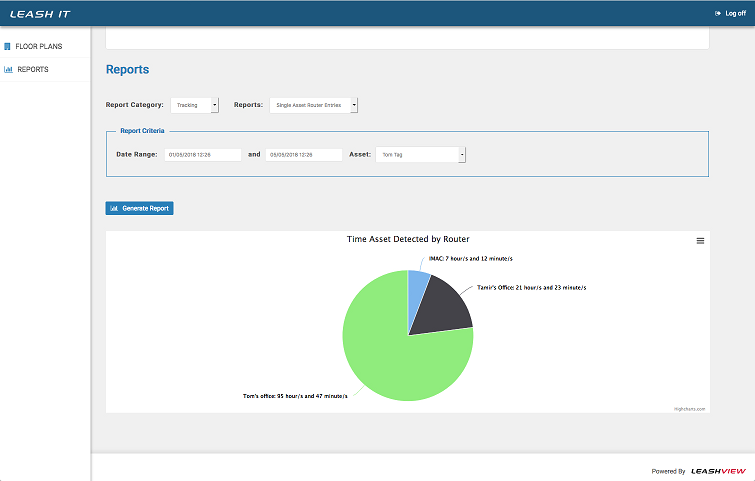 Asset tracking software eliminates messy spreadsheets, streamlines physical inventories, and helps you take control of your organisations valuable property. We make asset tracking easy. Businesses in today’s corporate landscape need to be able to track and locate valuable mobile assets at a moments notice; there has never been more demand for transparency. Accurate location data helps management not only track items but also manage compliance, servicing and depreciation. LeashView web based software allows staff to access location data and view it on a live floor plan from any device with a web browser. Printing reports, managing compliance and usage data has never been easier. Leash It’s unique Bluetooth (BLE) Asset Tracking solution extends tracking well beyond the capabilities of RFID or GPS. Our software and devices work seamlessly to track, manage and maximise the utilisation of high value assets. Regardless of what you would like to track, Leash It’s Real Time Locating System (RTLS) will provide your business with the insights you require. Our UX team takes great care in designing all our solutions to fit the client’s specific needs, whether it’s mobile medical devices in hospitals, shipping containers in ports or car fleets. 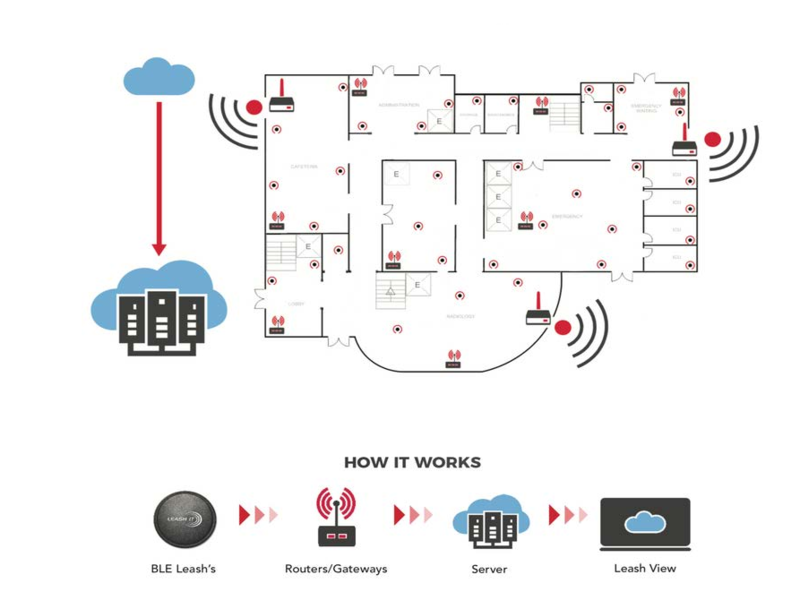 Our solution utilises Wi-Fi to BLE wireless gateways, BLE Leash’s and local, private or cloud based servers. Each BLE Leash contains a unique ID that users can identify to a specific asset. Communication between the Leash’s and gateways is customisable and can be set to 1 second, 5 seconds and even daily calls with accuracy being as close as half a metre. 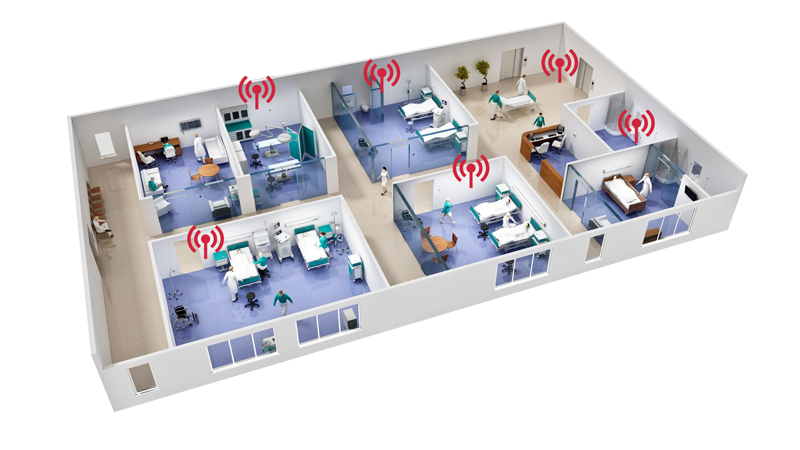 As our RTLS uses a low powered BLE frequency it does not disturb or interfere with other frequencies, making it ideal for sensitive facilities such as hospitals. LeashView collects all the location data and provides the user with an easy to use interface. Knowing the location of all your valuable assets 24/7 enables you to make more informed decisions, in many organisations, the under utilisation of assets can cost hundreds of thousands of dollars each year. More informed buying decisions enables businesses to stay efficient and agile, leading to better utilisation of valuable assets. 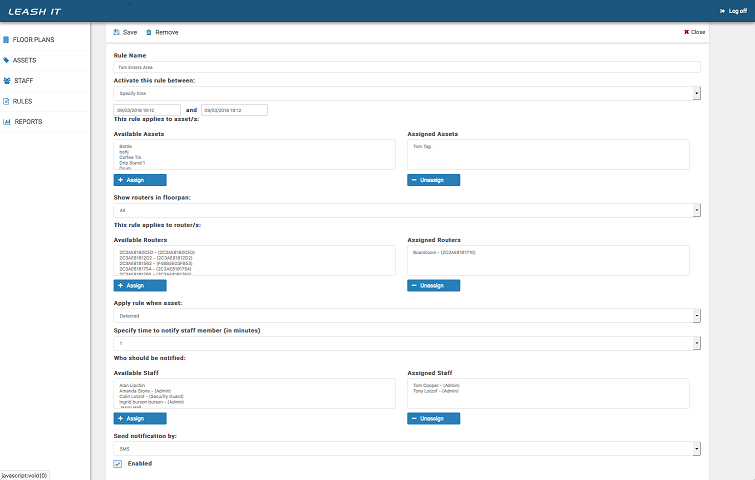 Knowing the location of assets also helps with managing compliance regulations, the Leash It software allows rules to be applied which alert management if a device has not been returned after a certain period. Use LeashViews operating system to optimise current processes of your staff and inventory to reduce running costs and increase profit at your health care centre or hospital. Mobile medical equipment is extremely valuable yet 15% goes missing each year and another 40% is being under utilised. Use location based-data to optimise your facilities’ staff tasks and inventory usage while processing customer orders. Improved security of mobile assets through realtime asset tracking and alerting, resulting in reduced capital expenditure and lower insurance premiums. Optimise inventory’s maintenance based on detailed information about usage and running times. The use of data makes decision making as well as optimising business processes and everyday operations more achievable. Any business process can generate data and when analysed using the correct tools can lead to the creation of new efficiencies. Critical to the delivery of analytics will be the development of our Artificial intelligence AI tools. These tools will analyse data and find anomalies. As the amount of data collected increases our Artificial Intelligence allows for personalised analysis of businesses data to look for anomalies. These tools will increasingly guide business interactions and insights, while delivering immediate efficiencies to businesses as well as ideas on how to evolve in the future. Our enterprise digital solution has been developed to enable our enterprise clients to actively track and find their assets and staff via our location-based data. Integrating our technology with existing data analytics systems is the new frontier of location based reporting on utilisation and productivity of their many assets. Using a hospital as an example, administrators, doctors and nurses can be informed on their smart phones or intelligent display screens about relevant information within the hospital. This can be customised by the time of day, visit length, their consulting or procedure information and building/floor location. Messages aim to provide just the right amount of information at just the right time.